Somewhere in November 1970, near The Hague, a blond kid was born. Somewhere around 1984, the blonde kid started to discover radio. Especially Radio Veronica (an old pirate station, just like Radio Caroline). More specifically the weekly Top 40 and the yearly Top 100 of all times. There he discovered songs from famous names as Deep Purple, Led Zeppelin, The Eagles, Derek and the Dominos… but also modern music from Mike Oldfield, Dire Straits, The Cure, The Sisters of Mercy, Marillion… and so much more. Until in 1988 Guns N’ Roses opened the door to Metal bands and even more quality music. The kid now found himself volunteering at a local alternative pop podium. There he discovered a love for concert photography. He also discovered how freaking expensive good equipment and developing films was.. so it never came past good intentions and a small hobby. He also found new alternative bands: Blur, Evanescence, HIM, Linkin Park. He also found a love for a different kind of Metal band… mixing Metal with medieval music or Metal and fairytales… Enter Schandmaul, In Extremo, Nightwish and Within Temptation. The kid, by now, had found himself a nice girlfriend in Germany. Knowing his general interest in old civilizations, she took him to a medieval market in Solingen near her home-town. That market visit ended up being rather significant in his story. It became a regular feature on their calendar … and they both acquired some decent medieval clothing to blend in with the local crowd. A friend, hearing of the regular visits to the medieval market in Solingen, wondered if a visit to Castlefest wouldn’t be interesting for the kid. “It ís a rather nice venue, with some interesting people and bands.”, he said. So the kid looked up some bands and was introduced to the music of Omnia. Within months he acquired half their back catalogue… infected his German girlfriend with the same Omnia bug… and the year after, 2013, they visited that famous festival for the first time. It was like coming home. There were people that looked the same, felt the same and shared the same dreams he always had. He had always felt a bit of an outsider in his life… here he didn’t. Inspired by this band Omnia and the magical musical world that suddenly appeared after he went to see them on this first Castlefest… the kid picked up concert photography again. His first attempts didn’t go totally unnoticed. A band of friendly Pagan musicians called SeeD and a experienced bowler hatted photographer called Kees Stravers encouraged him to continue… despite some obvious beginner mistakes. But that is the way things go in the loving Pagan world. On his internet travels he also met this certain Alex Sealgaire who, at that point, was together with Arjan starting up a radio station dedicated to the acoustic Pagan folk music they both loved. He asked the kid to join him… A bit shy and hesitant the kid declined… only to end up as a moderator of the Omnia Facebook fangroup. Go figure. In the Castlefest afterglow, the kid and Alex spoke again about life in general, concert photography and the love of music that they still shared. They also talked about a possible position for the kid within the CeltCast radio station. 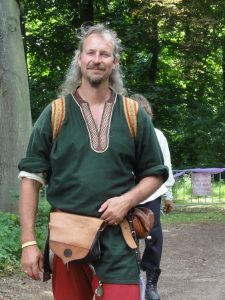 For a person willing to share some photos and feed some positive vibes (and cool Pagan folk news facts) towards the CeltCast Facebook community and also to write CD introductions. So the fans would know about new Pagan Folk CD’s that were coming out. And this time… he finally agreed.